Haruko Takakuwa (email: takakuwa.haruko@ocha.ac.jp) is Associate Professor at Ochanomizu University, Japan. Her main interests are in early-nineteenth-century domestic novels and national tales, and she has published articles on such writers as Jane Austen, Maria Edgeworth, Sydney Owenson, and Susan Ferrier. adapted and illustrated by Mochizuki Reiko. © Ohzora Publishing Co., Ltd. 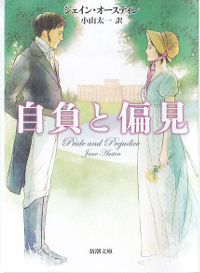 The front cover of the newly-translated Pride and Prejudice, by Koyama Taichi. An underlying factor for these forms of “popularization” in Japan seems to be the film adaptations of Austen’s novels in the 1990s and the 2000s. They were received as quality films in Japan, investing in the “elegance” of English cultural heritage; and as such, “country house,” “gentility,” and the English “tea” were their marketing features. For the Japanese audience, the heritage-film versions highlighted the “love and romance” aspect against the backdrop of genteel, rural England. It is thus telling that the manga versions, faithfully copying their respective films even to the characters’ hairstyles and costumes, are categorized in the “Romance Comics” series, which also includes the adaptations of Barbara Cartland’s romance novels. The prevalence of the heritage-film Jane Austen in Japan can also be seen in the front cover of the most recent Japanese translation of Pride and Prejudice, featuring a Colin Firth-like Darcy and a Keira Knightley-like Elizabeth in front of a BBC-version Pemberley. It is within such a context that Takarazuka staged Pride and Prejudice as their original musical. Takarazuka, famous for being an all-female company, specializes in dramatizing female fantasies of love and romance with attractive “male” leading roles. For Takarazuka, too, Pride and Prejudice provides an ideal, genteel romance plot between the spirited Elizabeth and the handsome and rich Darcy through which to appeal to their predominantly female audience. This paper looks into how Takarazuka adapts Austen’s novel into its own style, with a strong inclination towards a fantasized romance plot and a male (rather than female) protagonist. The Takarazuka version, designed to serve the audience’s longing for a Harlequin-style romance, in turn highlights the novel’s realistic, class-conscious outlook centered on the heroine as crucial in realizing its romantic marriage plot. Before discussing the Takarazuka version of Pride and Prejudice, let me outline the history of the Takarazuka Revue and some of its characteristics and conventions.3 The all-female Takarazuka Revue Company started in 1914 as an attraction of the newly built spa resort Takarazuka Shin-Onsen. At the very beginning, Takarazuka (then called the Girls’ Opera Company) performed “operas” or music dramas based on fairytales, but it soon established its reputation in the late 1920s with the introduction of Parisian revues. Around this time the performers came to specialize either in male roles or female roles, and the company experienced the first surge of popularity for male-role players. Takarazuka lived on through the war into the post-war period (with a closure at the very end of World War II) producing renowned male-role stars. While audiences dwindled with the introduction of television in the 1960s, the staging of Berusaiyu no Bara [The Rose of Versailles] in the mid-1970s, a musical based on a best-selling Japanese comic series set in the court of Marie Antoinette, regenerated the enthusiasm, to which the present-day Takarazuka more or less owes its acclaim. It is worth noting here that Takarazuka was born in the modernizing and westernizing atmosphere of the Taishō period (1912-1926). From the start, the founder, Kobayashi Ichizō,4 emphasized the use of western music, defining it as “national music” for modern Japanese citizens (Kobayashi 162). As the head of the multi-faced Hankyū/Tōhō Corporation (comprised of railways, real estate, department stores, and entertainment) Kobayashi conceived the Girls’ Opera as a wholesome, accessible, and affordable entertainment for a newly-rising group of consumers, namely middle-class women.5 Attention to this audience may be one of the reasons why Kobayashi adopted the girls’ school system as the model for his theatrical company. The performers have to attend the Takarazuka Music School (whose name suggests that it offers accomplishments for young ladies rather than professional theatrical training) for two years before going on to the stage. The performers are still officially called “students,” and the stage performance is regarded as “a recital of the students’ daily pursuit.” By defining the Takarazuka performers as “students” and not “actresses,” Kobayashi presented the Takarazuka “students” as an ideal of modern womanhood—“modest, upright, graceful” and “cheerful” young women fit to be prospective wives and mothers of the newly-rising urban middle class families (165). In a way, such spirit of “Taishō modernism” still defines the present-day Takarazuka. “Modesty, fairness and grace” lives on as the motto for Takarazuka. Thus the company most conspicuously insists that all the performers be unmarried, emphasizing them as otome or maidens. The supposed virginity of the performers allows the company to stage most romantic love stories as wholesome fantasy fit and respectable middle-class families. Also, Takarazuka stringently offers heterosexual love plots, thus functioning as an educational system promoting conventional gender role models. Another characteristic Takarazuka carries on from its early days is the eagerness to embrace the Western world: Europe and America are often rendered as appropriate settings for romance. Its strong inclination towards adaptations of literary classics (one of the company’s greatest hits is Gone with the Wind) and importations of Broadway and European musicals may also be a nod towards the Western culture to which modern Japan so aspired. 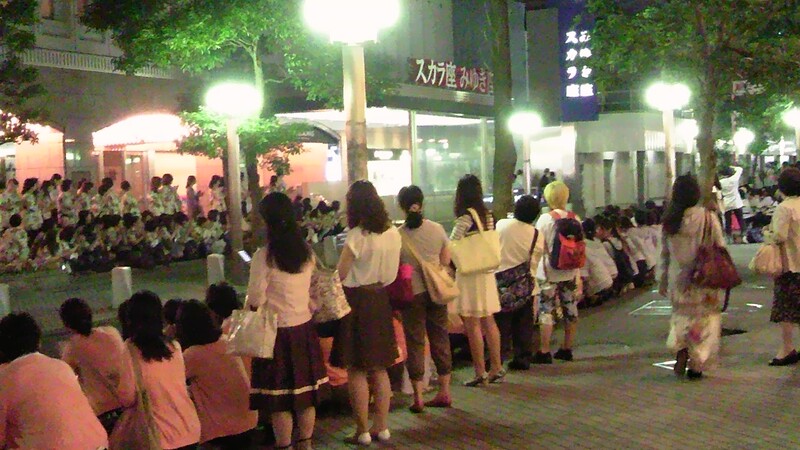 Devoted Takarazuka fans waiting for the performers in front of the theater. As an all-female company with a strong leaning towards romantic plots, Takarazuka has also developed unique conventions. The most significant characteristic is Takarazuka’s world centers on the male characters; while the performers themselves may represent a kind of liberation from a fixed gender role through their choice to become otokoyaku, or male-role players (Robertson 84-85; Kawasaki 155-56), the stage itself is based on the conventional heterosexual gender model: it is always an attractive male-role player that plays the lead while musumeyaku, or female-role players, can only play opposite the lead.6 Moreover, Takarazuka adopts a strictly hierarchical model in promoting its male-role “stars.” At the top of the pyramid is a so-called “top star,” who always plays the lead with her fixed female-role partner. Immediately below her is a “number two,” who constantly plays the most important supporting male role, and the performers are thus ranked according to their potential as “stars.” One of the requisites of Takarazuka performance, then, is to provide each of these performers her highlight scenes according to her rank in the hierarchy, while designing the heterosexual love plot between the hero and the heroine to prevail the whole performance. How, then, does Takarazuka adapt Pride and Prejudice and turn it into its own Angels’ Ladder? While basically true to Austen’s plot, Angels’ Ladder is very “Takarazuka-like.” The scriptwriter and director Suzuki Kei treats the novel as subject matter for creating a typical Takarazuka stage (Suzuki, Suzumi, and Otowa 77). The title of the Takarazuka version itself suggests a rosy vision of love and Harlequin romance. (“Angels’ ladder” refers to crepuscular rays, rays of sunlight that stream through the gaps of clouds, which may invoke English landscape paintings by Constable or Turner.) The performance begins with a “prologue” of a brief ballet sequence by the angels in white tutus (not unlike the cupids in the ballet Don Quixote), which gives a fairytale-like gloss over the stage. The same angels celebrate the marriage of Darcy and Elizabeth at the end. The main story is quickly followed by the typical Takarazuka “finale,” comprised of a stylish dance by the male-role cast and the so-called romantic “duet” dance by the lead and her partner. To make Pride and Prejudice work within Takarazuka’s grammar, obviously Elizabeth Bennet’s story has to be turned into that of Fitzwilliam Darcy. Suzuki presents Darcy as a hero who hides his passion beneath a stiff, proud façade. Darcy’s romantic nature is revealed in musical numbers: for example, after getting to know Elizabeth better, he dreamily thinks of her as “angel” in the song “You Are an Angel,” or, after the disastrous first proposal, he breaks into a heart-rending aria (“Living under the Star”). To make the audience share Darcy’s point of view, Wickham’s attempted elopement with Georgiana Darcy is revealed quite early—in fact, immediately after their encounter at Meryton—thus stressing that Darcy’s interference in the Bingley-Jane affair is triggered by his bitter experience. As in the 1995 BBC version of Pride and Prejudice, a fencing scene is created to show Darcy’s stoic determination to heed Elizabeth’s criticism, and the confrontation with Wickham at his London lodging is dramatized in detail. Further, it is Darcy and not Elizabeth Bennet who stands up to Lady Catherine de Bourgh, persuading her of his passionate love for Elizabeth and of the futility of the upper-class pride and prejudice. Other male characters are also given due importance to meet the requirements of Takarazuka’s hierarchy. In this instance, the role of George Wickham is given to the number two male-role player of the company, while Charles Bingley is played by the number three. The role of William Collins is allotted to a rising, versatile male-role player. Suzuki takes care that these male characters should not appear totally repugnant to the female audience. While the characterization of Bingley is straightforward (as in the novel he is a well-bred, good-natured man), Mr. Collins’s servility and pompousness is turned into a mere eccentricity; he becomes an overreacting, clumsy fellow, a likeable buffoon rather than an outrageous snob. He is also rendered important in that he explains the plot to the audience. Wickham’s modification is even more significant. While presenting him, as in the novel, as a profligate womanizer, Suzuki dramatizes Wickham’s bitter disappointment at his fortune and his rivalry towards the more fortunate companion of his youth, Darcy. Furthermore, when confronted by Darcy at the London inn, he (somewhat surprisingly) confesses his genuine, tender feelings towards Lydia, remarking that her artlessness and cheerfulness have softened his bitterness and that he wishes to turn a new leaf for her sake. Thus, the antagonist of the play is given an appealing part as the reformed rake, which in turn reflects upon the upright Darcy, who generously forgives him and gives him a chance to start afresh. As male-characters are thus foregrounded in the Takarazuka musical, Elizabeth Bennet’s importance is inversely diminished. Compared with the novel, her consciousness gets less attention. As I have already mentioned, the important conversation with Lady Catherine, where Elizabeth asserts her equality as “‘a gentleman’s daughter’” (395), is altogether omitted. While Elizabeth’s spiritedness is a great charm on the stage, the almost combat-like nature of her conversations with Darcy is somewhat curbed, and, instead, Suzuki emphasizes her girl-like innocence. The Elizabeth of Angels’ Ladder is an innocent idealist who believes in the fairytale that the lovers who meet beneath the beautiful crepuscular rays, namely the angels’ ladder, will be happily united. The youthful idealism, rather than her sharp wit and acute observation, becomes the most commendable feature for Elizabeth as a Takarazuka heroine. With such modifications, Takarazuka fans and critics appreciated Angels’ Ladder as a typical Takarazuka “feel-good” production with a traditional romance plot of misunderstanding and reconciliation (Miyatsuji 52; Nagaoka 72-73). The fact that Darcy’s “noble mien” suited the lead Suzumi Shio’s refined acting style led to the favorable reception in Takarazuka culture (Ohgoshi 43-44), where the audience tends to put more weight on whether the script succeeds in drawing out the performers’ personal appeal than on whether the script itself is well-written. The fact that the supporting male-role players had good scenes and that the female-role players also had good parts as the Bennet sisters also contributed to positive ratings (Iwami 77-78; Nagaoka 72-73). On the other hand, there were some historical inaccuracies. It is inevitable that the intricate social differences among the Darcys, the Bingleys, and the Bennets should be reduced to the binary of the rich (the Darcys and the Bingleys) and the not-so-rich (the Bennets); as present-day Japanese society has no rigid class system, it is necessary to simplify difference in rank into monetary terms to make it understandable to the contemporary Japanese audience. Therefore, in the Takarazuka version, there are no indications that the Bingleys are, in fact, a newly risen family with a trading background and no estate of their own and that, however small their means may be, the Bennets have been established as country squires well before them. Also, Takarazuka is quite casual about dates and locations: the playbill mistakenly announces that the story is set in the English countryside of the seventeenth and eighteenth centuries, while the performers wear costumes that vary from short-bodied Regency gowns to crinolined Victorian skirts, and from knee breeches to long trousers. The audience is not too sure where Longbourn, Netherfield, Rosings, and Pemberley are, either. Suzuki states that the title Angels’ Ladder was inspired from the landscape of the Lake District (Suzuki, Suzumi, and Otowa 76), and he seems to set his stage somewhere in that vicinity. (Hence, the Bennets have to go “over the hills and dales” to attend the Meryton ball.) The theater critics did not seem to mind these inaccuracies.7 For Takarazuka, what matters in Pride and Prejudice is the genteel English atmosphere of some olden days in which the difference of social standing was a great barrier for the lovers to overcome. What Angels’ Ladder really highlights through its adaptation, however, is the difficulty of reorganizing the story around Darcy. In spite of the various Takarazuka conventions that foreground Darcy, Suzuki does not necessarily succeed in doing so. For one thing, as Iwami Natsuko points out in her review, Suzuki seems to find Elizabeth’s viewpoint too fascinating to discard (76). The excitement caused by the news of the newcomers, the pride wounded by Darcy’s ungracious remark at the assembly, the puzzlement at his inexplicable behavior—the readers of Pride and Prejudice more or less share the worldview Elizabeth has construed. Hence the drama of the disastrous first proposal and Darcy’s letter that follows it lies in the readers’ realizing how wrong Elizabeth can be with all her acuteness and observations. In this sense, Suzuki’s version also relies on the pride and prejudice on Elizabeth’s part to propel the drama. This reliance may be partly because Darcy is not an articulate character. In Pride and Prejudice what the readers mainly see of him is limited to his restrained reactions to Elizabeth, her family, and his friends and relatives; most of his important actions are only subsequently reported. One of the difficulties of spin-offs centering on Darcy is the fact that Darcy does not seem like Darcy once he pours his heart out. Darcy’s passivity in this sense is so essential that Suzuki, too, seems to have had a hard time making him the center of the drama. Further, while members of the Bennet family provide slapstick scenes to enliven the performance and establish the worldly outlook of the middling gentry behind Elizabeth and Darcy’s Cinderella plot, Angels’ Ladder reminds us that the strength of Pride and Prejudice lies in the characterization of a “bourgeois” individual heroine (to use Franco Moretti’s concept [58-60]): Elizabeth Bennet and her worldview. Thus, in some ways, the concentration on the Darcy-Elizabeth love plot in Angels’ Ladder diminishes the satirical and ironic tone of the original. The realistic outlook towards marriage and women’s lives is kept to Mrs. Bennet’s desperate but comical attempt at matchmaking. Even Charlotte’s decision to marry Mr. Collins is in some respects not so bitter because he is only a buffoon, and the wry fact that she contrives to keep her husband away as much as possible is not dramatized. The divide between Mr. and Mrs. Bennet is not so wide, as Mr. Bennet is made more fatherly (he gently warns Elizabeth against the danger of being prejudiced), and Elizabeth somehow seems to inherit her romanticism from her mother (it is Mrs. Bennet who told her the fairytale about the angels’ ladder). In this way, the sharp and sometimes almost unkind observations of manners and characters in the original are curbed, and the world of Angels’ Ladder inclines towards a happily-ever-after ending, where we suddenly find Kitty already betrothed to Captain Denny and where even Lady Catherine de Bourgh repents her haughtiness. To conclude, Pride and Prejudice provides Takarazuka with ideal material for creating its typical production. The genteel style of writing without any overtly sexual or sordid references matches the idealized image of love on the Takarazuka stage. A costume play set in Europe is also a forte of Takarazuka, whose exoticism derives from the westernizing ideology of the Taishō period. As a consequence, Pride and Prejudice is presented as a sugary world of romantic love in which the Japanese female audience can invest. At the same time, such simplification has made Angels’ Ladder too sweet and perhaps too good to be true, making us realize that the ideal romance of Darcy and Elizabeth is rendered convincing in Austen’s novel precisely because Pride and Prejudice provides the reader with some dire realities of marriage and women’s lives, and of subtle class and monetary differences at the turn of the eighteenth into the nineteenth century. The difficulty of presenting Darcy’s story also reminds us how much the novel depends on the characterization of the heroine Elizabeth Bennet and on her viewpoint as a fortuneless daughter of the middling gentry. Angels’ Ladder simplifies and harlequinizes Pride and Prejudice’s romance at the expense of its more complex characterizations and social observations, thus transforming it to a typical dream-like romance of the Takarazuka world. 1. This is a revised version of the paper presented at the conference Pride and Prejudice: Celebrating 200 Years of Jane Austen’s Best-Loved Novel at Lucy Cavendish College, University of Cambridge, on 21 June 2013. For the concise history of Austen’s reception in Japan, see Ebine, Amano, and Hisamori. 2. Angel’s Ladder was staged at the Main Hall, Nihon-Seinen-kan, Tokyo, 7-12 March 2012, and at the Takarazuka Bow Hall, Hyogo, 19-31 March 2012. I regret that permission for the reproduction of stage images and posters was not granted. However, the poster for Angels’ Ladder can be seen at Takarazuka’s archive page: http://archive.kageki.hankyu.co.jp/revue/backnumber/12/bow_star_angelsladde/poster.jpg.html. Recordings of the performance itself are not available, but the album of the musical numbers is on sale at the TCA (Takarazuka Creative Arts) Music website: http://www.tca-pictures.net/music/cgi-bin/detail.cgi?goods_code=TZK-864". 3. There are a number of books on the history of the Takarazuka Revue Company. Leonie R. Stickland’s Gender Gymnastics provides a concise overview in English (17-50). See also “Takarazuka History” at the Takarazuka Revue Company’s official homepage: http://kageki.hankyu.co.jp/english/history.html. 4. Throughout this paper Japanese names are given in the Japanese style, surname first and given name last. 5. It is worth noting that the Takarazuka theater is a part of Kobayashi’s garden-city scheme for Hanshin (Osaka and Kōbe) district. The ideal suburb was inseparable from the concept of the newly rising middle-class family, and this emphasis on family meant underscoring domestic women (Tsuganezawa 146-56). 6. The asymmetrical positioning of female-role players in Takarazuka’s logic is revealed in the Japanese term musumeyaku: musume translates as “young maiden” or “daughter” and not “female” or “woman.” This term indicates that in Takarazuka, a female-role player typically underlines her youth and cuteness as opposed to a male-role player’s maturity and magnanimity. 7. For example, Iwami unquestioningly repeats that the story is set in the seventeenth- and eighteenth-century English countryside (76); Nagaoka further misunderstands Pride and Prejudice as a story of the Middle Ages (73). Ebine, Hiroshi, Miyuki Amano, and Kazuko Hisamori. “Jane Austen in Japanese Literature: An Overview.” Persuasions On-line 30.2 (2010). Hanabusa, Yoko, adapt. and illus. Emma. Romance Comics. Tokyo: Ohzora, 2011. Iwami, Natsuko. Rev. of Tenshi no Hashigo. Takarazuka-ism 20 (June 2012): 75-79. Kawasaki, Kenko. Takarazuka toiu Yutopia [A Utopia Called Takarazuka]. Iwanami-Shinsho 940. Tokyo: Iwanami, 2005. Kobayashi, Ichizo. Watashi no Ikikata [My Way of Life]. Tokyo: Yamato-Shuppan, 1992. Koyama, Taichi, trans. Jifu to Henken [Pride and Prejudice]. Shinchō-Bunko. Tokyo: Shinchōsha, 2014. Miyatsuji, Masao. Rev. of Tenshi no Hashigo. Kageki [Takarazuka Revue] May 2012: 52. Mochizuki, Reiko, adapt. and illus. Bara no Koi, Yuri no Koi: Funbetsu to Takan [Sense and Sensibility]. Romance Comics. Tokyo: Ohzora, 2010. _____, adapt. and illus. Kōman to Henken [Pride and Prejudice]. 2 vols. Romance Comics. Tokyo: Ohzora, 2009. Moretti, Franco. The Way of the World: The Bildungsroman in European Culture. Trans. Albert Sbragia. New ed. London: Verso, 2000. Nagaoka, Toshiya. Rev. of Tenshi no Hashigo. Takarazuka-ism 20 (June 2012): 72-75. Ohgoshi, Aiko. “Takarazuka-Ai no Hito [Devotees of Takarazuka].” Takarazuka-ism 21 (Sept. 2012): 42-45. Robertson, Jennifer. Takarazuka: Sexual Politics and Popular Culture in Modern Japan. Berkeley: U of California P, 1998. Stickland, Leonie R. Gender Gymnastics: Performing and Consuming Japan’s Takarazuka Revue. Japanese Society Series. Melbourne: Trans Pacific, 2008. Suzuki, Kei, Shio Suzumi, and Minori Otowa. Interview on Tenshi no Hashigo. Kageki Mar. 2012: 76-78. Takarazuka-Kagekidan. Tenshi no Hashigo. 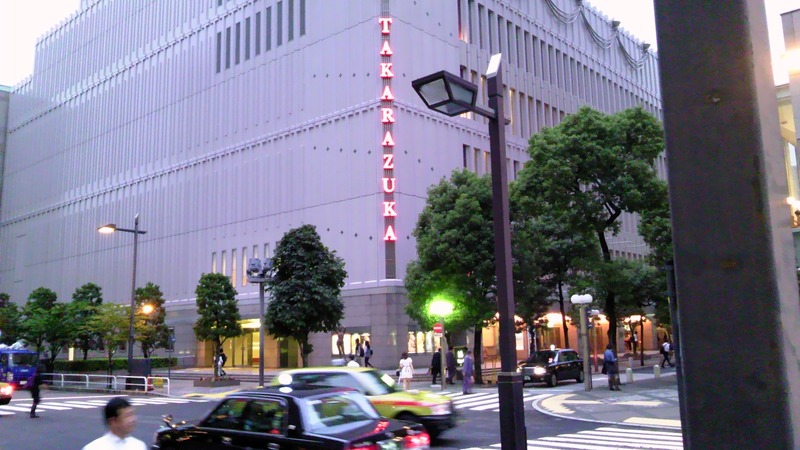 Takarazuka: Takarazuka-Kagekidan, 2012. N. pag. _____. “Kōen Annai: Tenshi no Hashigo [Stage Information: Angels’ Ladder].” Takarazuka Kageki Official Web Site. Takarazuka-Kagekidan, n.d. Web. 7 Feb. 2015. http://archive.kageki.hankyu.co.jp/revue/backnumber/12/bow_star_angelsladde/poster.jpg.html. _____. “Takarazuka History.” Takarazuka Kageki English Page. Takarazuka-Kagekidan, n.d. Web. 7 Feb. 2015. http://kageki.hankyu.co.jp/english/history.html. 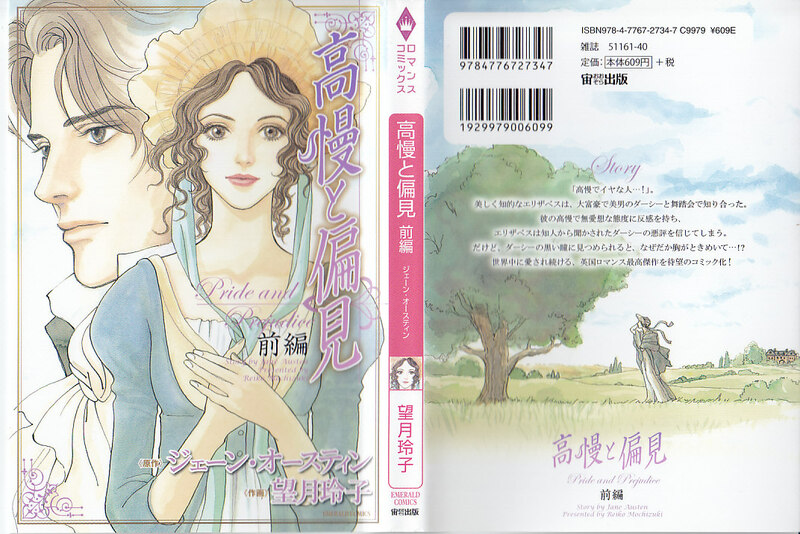 Tenshi no Hashigo [Angels’ Ladder: Based on Jane Austen’s Pride and Prejudice]. By Kei Suzuki. Perf. Shio Suzumi and Minori Otowa. Star Troupe, Takarazuka Revue Company. Nihon-Seinenkan, Tokyo. 8 Mar. 2012. Tsuganezawa, Toshihiro. Takarazuka Senryaku: Kobayashi Ichizo no Seikatsu-Bunkaron [The Strategy of Takarazuka: Kobayashi Ichizo’s Cultural Theory]. Kōdansha-Shinsho 1039. Tokyo: Kōdansha, 1991.